The Case of the Missing Bouquet. I’m going to tell you a story. Are you are sitting comfortably? Yes? Then I’ll begin. Once upon a time there was a girl, she loved flowers, so much in fact that she got a job in a florist shop. Many people(when I say “people” I mean boyfriends/husband/life partner etc )on learning her chosen occupation, decided that it gave them an “out” as it were, to not buy her any. “OH but you work with flowers, I’d be scared I got the wrong thing!” Was/is a common excuse when challenged on the lack of blooms on a birthday etc(even Valentine’s day was ignored by a couple of boyfriends who claimed it was SO Difficult they didn’t bother. In hindsight I realise now it was NOT my fault, but was in fact due to them being tight(yeah ok, when I said “her” I meant “me”)! 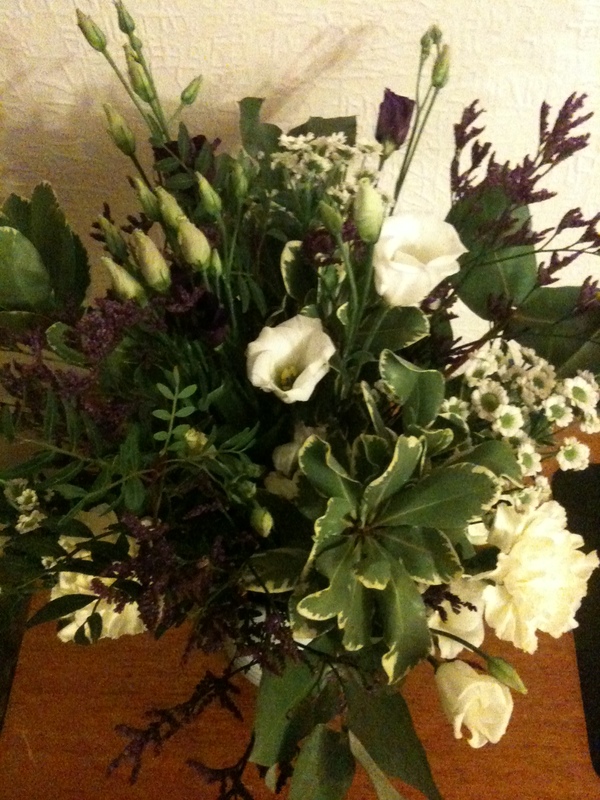 In fairness my other half now, is lovely AND I do(did) get surprises really nice bouquets, it’s just not that often. 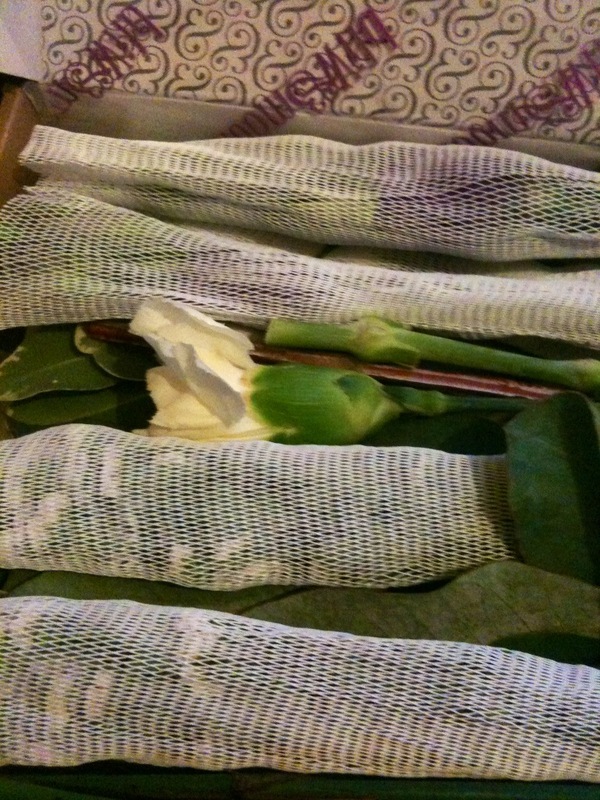 And…um….yes the last twice I have complained about the state of the arrangement sent by the florist…so that maybe goes some way to explaining why it is not a more regular thing. “Shot myself in the foot”, is a phrase springing to mind! Anyhoo, I have found the solution! 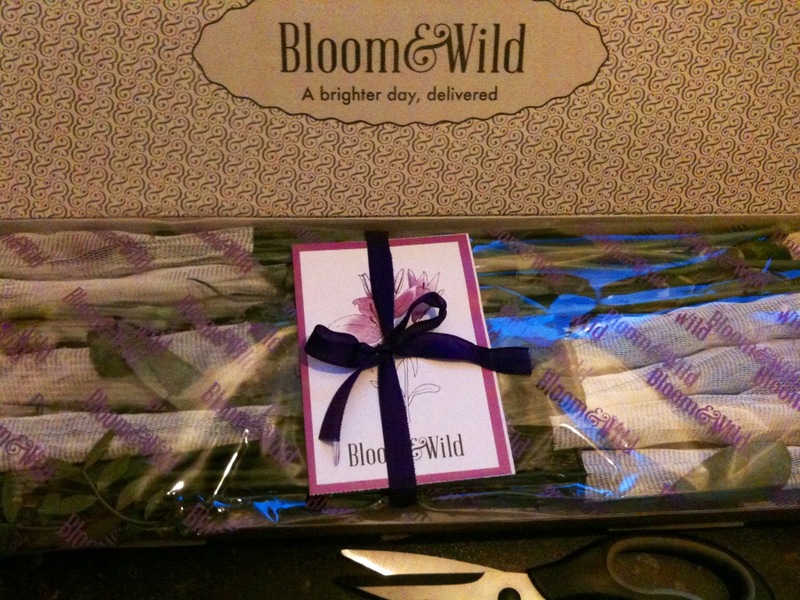 BLOOM & WILD (< click name for a link) are a company with whom you set up a flower SUBSCRIPTION-genius eh? Pick your price range and they send you a box of gorgeous blooms through the letterbox(I don’t have a standard size so was handed them by my lovely postie)! I was/am impressed! For the money they are great flowers, well thought out selections and with gorgeous packaging. Also just in time for Valentine’s Day they have come with a great way to drop a “hint” to someone that you really, yes even though you are a girl/a florist/a gardener/a boy/look at flowers occasionally etc etc and all those rubbish excuses, REALLY would love a bunch for a gift. Brilliant! 🙂 It’s FAB value too at £50 for THREE bunches for 3 months! that’s £16.66 if you’re a maths type person and worked it out! Getting back to the flowers I got , let me start at the beginning. When I get a gift, any kind of gift, if it’s wrapped in brown paper or a cardboard box and nothing else, no matter the present within, it kind of just doesn’t have the same effect as a package that’s been thought about. These are flowers straight from the grower and so are never going to look anything other than stems, laid on their sides in a box. But if they have a nicely designed box, fabulous cellophane and a really nice purple bow, TAH DAH! They suddenly DO look more interesting and luxurious. Brilliant! One thing that you are up against, being at it is a box of flowers and not arranged in any way, is that you do have to put the flowers together in some fashion in the vase. If you are not a florist or have never been to a floral art class in your life you might think you have no idea what to do. Resist the urge to panic! 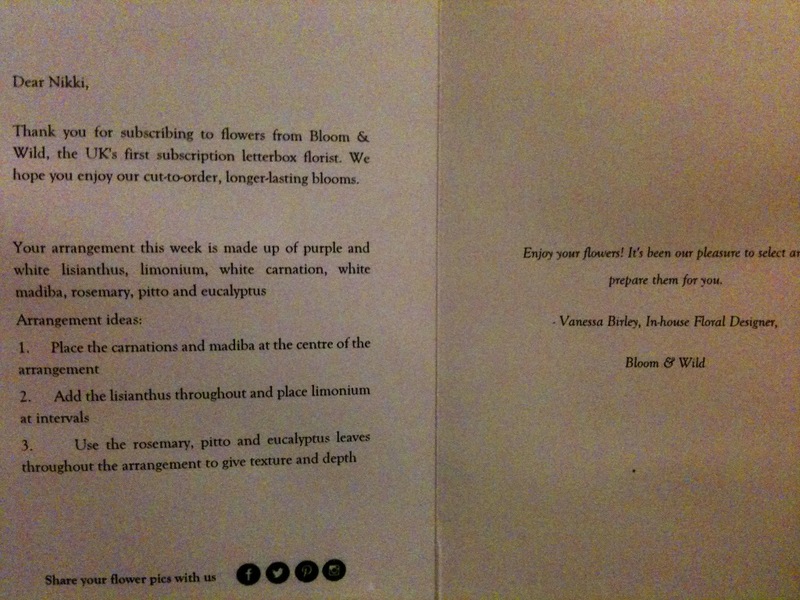 For fear not, there are even instructions(know of another flower company who does this? I don’t) on how to place the blooms, as long as you have a vague idea what they are. There are drawings of some of the most popular flowers/greenery but not all. You will however get a good idea of what to do from the guide, so you’ll be fine. What you actually get I the box is a good balance of greenery and flowers, colours & variety of flowers are well chosen(nothing garish) the overall look being classic and elegant. Apparently they are also thinking of doing selections by colour too, which would be amazing, considering all the friends I have who are lovers of only white flowers. 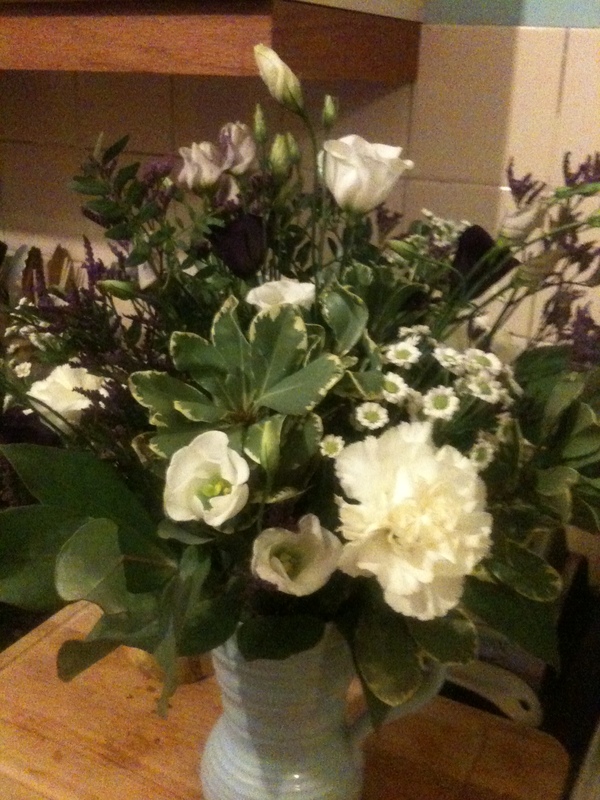 My flowers have lasted well into the second week, with central heating on that’s some feat! I have the greenery and carnations still going in a now smaller vase, they may even last until my next bunch, I’ll keep you posted on that! If you are thinking of starting a subscription for a Valentine’s gift, I can honestly say I think you’re on to a winner, a gift that you get again & again, only a good thing right? Go forth, gift flowers to someone and revel in being a fabulous boyfriend/girlfriend/wife/husband/life partner/superhero whatever you want to be called(‘cos that’s what you are)! ps. I do know some of my photos are not brilliant, but I don’t mind that they are a little imperfect. Hope you don’t mind either 🙂 If I was looking on a blog and the shots were all as if a professional had taken them, frankly I’d be suspicious and think I was (perhaps) being fed a “line” as it were. Love this! Such a wonderful idea for a gift. Will have to leave this page open for the hubby to see lol.